Number one is that eka now has a blog which is updated regularly with news about eka and other things that influence eka and make it what it is and what it will be. 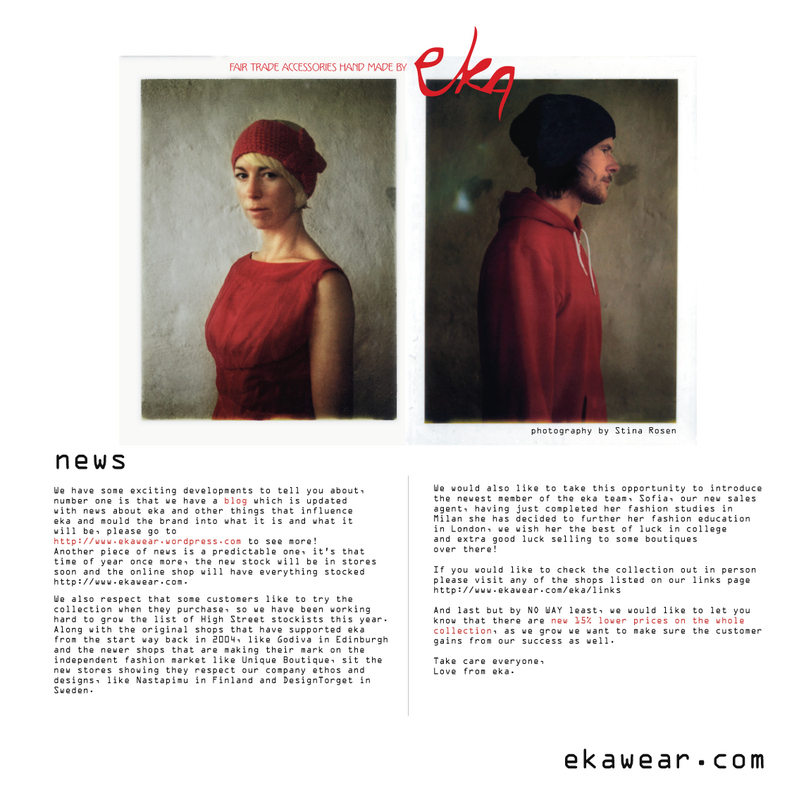 Another piece of news is a predictable one, it’s that time of year once more, the new collection has arrived and will be in stores soon as well as on the eka online store. We also respect that some customers prefer to try the collection when they purchase, so we have worked hard to grow the High Street stockist list this winter. Along with the original shops that have supported eka from the start way back in 2004, like Godiva in Edinburgh and the newer shops that are making their mark on the independent fashion scene like Unique boutique in Manchester, sit the new stores showing they respect our company ethos and individual designs, like Nastapimu in Finland and Design Torget in Sweden. If you would like to check the collection out in person please visit any of the shops listed on our links page. We would also like to take this opportunity to introduce our newest team member, Sofia, our new sales agent, having completed her education in Milan, she has decided to further her fashion studies in London. We wish her the best of luck in College and extra good luck finding some new boutiques to sell eka over there! And last but by no way least, we would like to let you all know that there is a permanent 15% discount on the whole eka collection, as we grown we want to make sure that our customers gain from our success as well.